Good morning everybody, and welcome to the 77th Funny Names in the News Report. That right there is more than enough reason to start following baseball. Thanks Mark! In local news, our Local News Correspondent Dave was wondering the halls of UCSD the other day and ran into an event announcement that looked a little bit like this. My name is Winkfield, but my friends call me Winkfield. Okay, so it looked exactly like that. 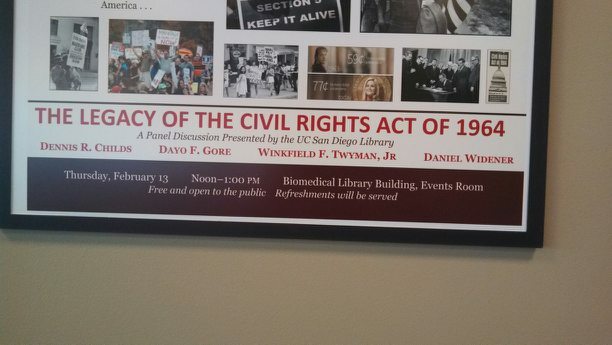 Nevertheless, we were delighted to see both Winkfield F. Twyman, Jr. and Dayo F. Gore listed among the panelists. If their presence didn’t already convince you that this was an event worth attending, see the small print in the bottom. “Refreshments will be provided”. Mmm-hmm. Love me some refreshments. In Serious News news, New York Sun editor Seth Lipsky went ahead and posted this video piece about the situation in Ukraine just a few days ago. And that’s all I’m going to say about that. Moving on to the world of business, and more specifically to the world of Swedish underpants. A world many of us are intimately familiar with, I will say, without providing any further details, to pique feelings of interest, curiosity, and slight repulsion in my readers. So big news is that the Bjorn Borg company has announced the identity of their new CEO, and to our great pleasure it is none other than Mr. Henrik Bunge. A solid accomplishment from Mr. Bunge there. Bunge. Thank you and a have a lovely weekend! This entry was posted in Uncategorized and tagged funny names, humor, news, not entirely serious news. Bookmark the permalink. Impressive stuff all around! I love FNITN Fridays! For a second there, I thought you were angry with me 🙂 But no, you’re just thrilled it was Friday! Harry knew of what he sang. And it was funny names. True. I mean, how many people are named Banana Boat, right? i really love zealous wheeler and think it would be the ultimate salesman’s name. Agreed. A bit of a wheeler dealer potentially. Well, it worked in 4th grade. Haha, sorry I missed the memo! Under where? Haha, oh man I missed the party here. Chuckles all around.